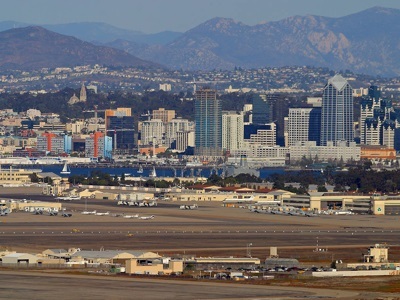 San Diego is a city on the coast of southern California, in the southwestern corner of the United States. As of 2006, the city had an estimated population of 1,256,951, making it the 2nd most populous city in the state of California, and the 8th most populous in the country. San Diego lies just to the North of the border with Mexico, on the immediate other side of which is the Mexican city of Tijuana. The combined population of the San Diego-Tijuana metropolitan area exceeds 4.9 million, making it the 21st largest metropolitan area in the Americas.